How do you remove polishing and compounding residue from foam and wool pads? 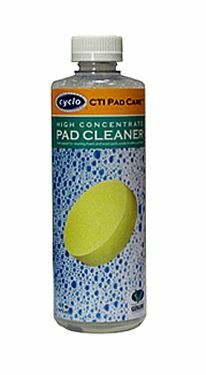 Cyclo's Pad Cleaner will remove the build-up, which if left in the pad, can destroy the structure. Instead of hard, unusable pads, you will have soft, flexible foam and wool for many months, or even years of use. The Cyclo Polisher Pad Cleaner can also be used for bio-friendly wheel and tire cleaning. Extend the life of all of your polisher and brush accessories. CTI Pad Care High Concentrate formula is ready for dilution with water. Apply with a spray bottle directly onto each pad or brush and press for deep cleaning. You can also mix with warm water in a bucket to soak pads and brushes immediately after use.